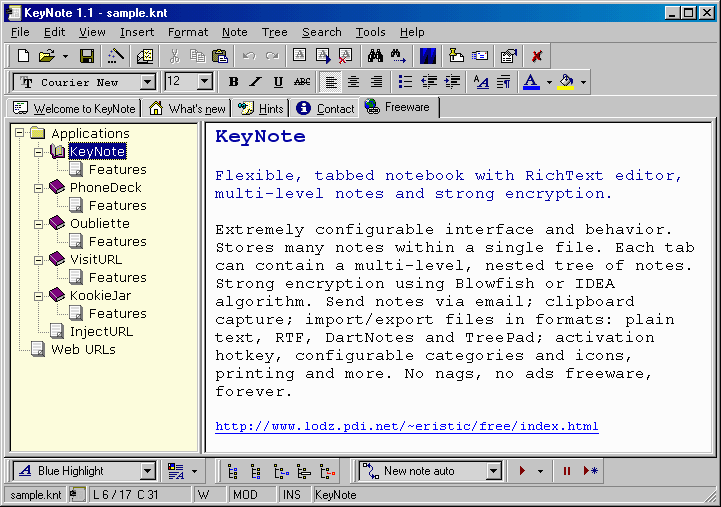 Keynote is a flexible notebook that is particularly suitable for writing and organizing free-form information, especially those that fit naturally within a tree-based structure, such as lists or outlines. A search function quickly locates information you are looking for. Notes can be easily and securely encrypted using either Blowfish or IDEA under the File - Properties menu. Keynote NF (New Features) is an updated beta fork of the original code. As the name suggests, it adds many features including check boxes on children of selected nodes, hidden nodes, alarms on nodes, better treatment of tables, improved treatment of links, multi-language support, automatic compression, etc. Keynote: Download the installer and install to the default folder. Then copy all files (except unins000.exe and unins000.dat) to a folder of your choice. Finally, uninstall the program. Launch keynote.exe -noreg. Keynote NF: No install required; download the ZIP package and extract to a folder of your choice. Launch keynote.exe -noreg. The -noreg argument is NOT required. Keynote NF 1.7.9 Beta 6 rar (Jan 3) is available. Am using on Windows 10 - 64 bit. No problems found. Great program. I've used this constantly every day for a couple of years now and absolutely love it. I run it from an encrypted partition and it's proved to be extremely stable and reliable on my two PCs (XP and Vista). I particularly like being able to pull in text or RTF files as virtual nodes. Better support for images (JPGs with drag and drop) would be useful so they could be included in notes. The download link for KeynotePortable zip appears to point to a link that only provides the source code. I'm not absolutely sure about this, but I'm pretty sure. I'm trying to run it on Linux using Wine. I searched around until I found a direct link to the most recent iteration of Keynote, which is now back in development, at http://code.google.com/p/keynote-nf/downloads/list where all "new" Keynote files are hosted. When I downloaded keynote-nf (New Features) which was packaged in Release_1.7.9.1 Beta 1.rar 799 KB and extracted keynote.exe it ran as normal without a hitch. This is a wonderful little app and I am extremely happy to see someone pick it back up for continued development. We are all better off for it. Both Keynote and Keynote NF are fantastic. The original has fewer features of course but also crashes a lot less. NF is very unstable. @Tom: in my installation, the search options allow setting filters. then only the nodes are displayed which fullfill the search criteria. This app has lots of bells & whistles -- maybe overkill for many who just want a simple note taker. Although it offers many features that others don't have, there is one feature missing that I happen to care about: the ability to show all nodes with matching text when you perform a search on the tree. So far, only TreePad Lite and The Guide has this capability. I don't even have .NET installed on this machine... It's a 100 MicroXP disk and the Keynote-NewFeatures version works perfectly. Sounds like you have some issues with your computer. That "new" one linked to, is dot net crap, so hardly portable. I'm new to portables but am worried about burning out my USB with too many writes and noticed that keynote seems to do a lot of autosaving. I was warned about something similar with FreeMind running portable. Should I just disable the autosave in my portable files? Is that enough? KeyNote fans may appreciate a new version at http://code.google.com/p/keynote-nf/. Argh -- the rest of my comment vanished! Is there a way to get Keynote to work with relative paths? When my drive letter changes, the Recent Files list remembers the old drive letter, and I must use File-open browser or drag the knt file onto the window. That's a minor annoyance, tho, and not a deal-breaker. I've been using this for 6 months, and it's great. Your comment is noted. I will update the main description to reflect the "-noreg" parameter. Reviewed the MRU file - there's nothing critical there, just a bunch of windows positioning and preference settings for various sections of the interface. Also location history of previous KNT file. If not used, these settings are applied to the registry and reduces the portability a bit. But I was able to run keynote.exe without any command-line parameters, and it writes settings to a couple of INI files eg. keynote.ini in the EXE folder. A batch file should do the trick. Once started this way, keynote will create an .MRU file in the Application directory instead of writing to the registry. As an fyi... the .DOC subDirectory contains a number of other useful command-line options.